WHAT IS THE MOKUME GANE TECHNIQUE? Mokume Gane (pronounced Moe-koo-may Gah-nay) is an ancient Japanese metalworking technique, developed in feudal Japan by master swordsmiths. The name translates as "woodgrain metal," referring to one of the most popular patterns created to adorn samurai swords. It followed the development of Damascus Steel (layered iron alloys), created hundreds of years earlier. Through the Mokume Gane technique, layers of contrasting colored metals are fusion welded, using very high heat and pressure, into one solid block or billet of metal. The billet is then further manipulated by forging, twisting, and carving to expose multiple layers, in order to develop more and more complex patterns. Traditionally, the Mokume Gane technique utilized copper, silver, and gold alloys. In the 1990s, STEVEN JACOB's co-founder, Steve Midgett, was the first to add platinum and palladium alloys to this list. He has more recently developed a groundbreaking technology that allows the use of many space-age metals like titanium, niobium, and tantalum, that cannot be worked by conventional means. 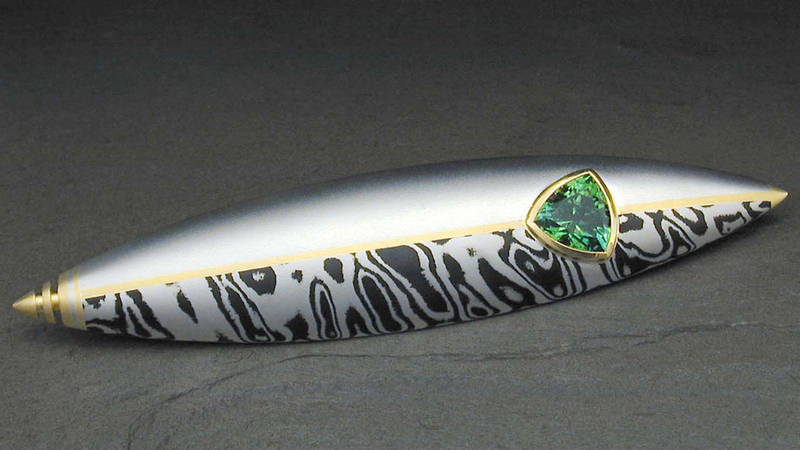 This tireless search for the most outstanding, and beautiful combination of metals, and for the best techniques to bond and pattern them, is at the foundation of STEVEN JACOB design. Having created a unique process for working with these materials gives STEVEN JACOB extraordinary artistic control over the pattern, bringing out the best in each ring, to make it a unique work of art. Rings using the Mokume Gane technique offer the perfect symbol of marriage—of two different elements permanently bonded together as one. The metals used in each of our Mokume Gane rings are permanently forge welded together, then cut, twisted, and formed into a ring. After crafting the ring, they are acid etched to bring out the pattern of the metal and then given a lustrous matte finish. STEVEN JACOB's solid, Mokume rings utilize the finest non-corrosive metals. Our titanium and zirconium Mokume bands are extremely inert and hypoallergenic. Our precious metal Mokume is made from high quality alloys and most importantly, do not contain layers of copper or predominantly copper alloys like brass, nickel silver, shakudo, or shibuichi. You can be confident that our rings will never corrode, rust, discolor, or de-laminate. 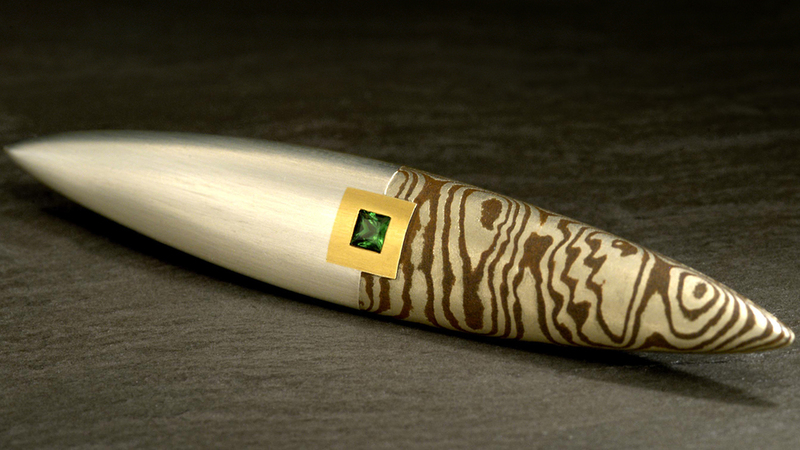 The next time someone asks, “What is Mokume?” Send them to Steven Jacob. We make all of our rings right here in the USA and pride ourselves on our attention to detail. Great care is taken through each step of the process, from the bonding and forging of the Mokume material, to hand finishing each ring to perfection. Intentional design, uncompromising workmanship, advanced technology, and amazing ergonomics all add up to the creation of quality, durable rings that will fascinate and delight you for many, many years. You will not find a finer ring using the Mokume Gane technique anywhere. Experimental Titanium and Niobium, Mokume pendant. Tantalum and 18K Mokume and diamond men's wedding band prototype. Three views of Steve's Mokume "Pod Form" pendant. Bronze and Nickel Silver Mokume Gane bar. Platinum, Shakudo and 22k "Shield" brooch. 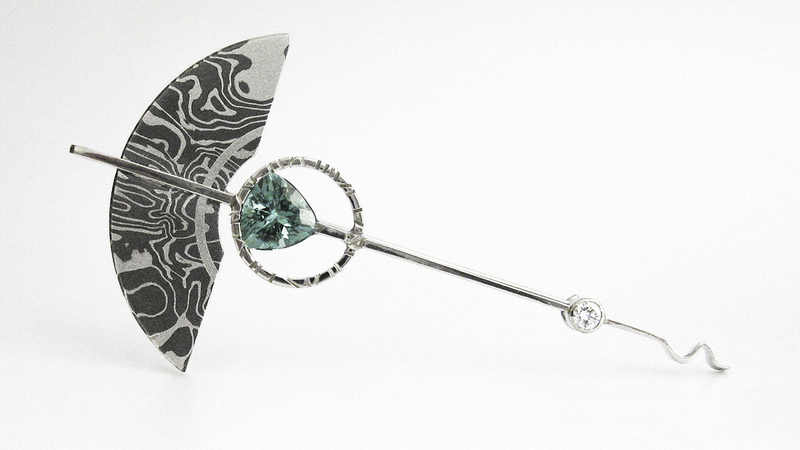 A brooch made from experimental Tantalum and Platinum Mokume Gane. Steve's award winning Titanium and Tantalum "Orbit" brooch. "Shield" pin with Mokume, Silver and 22K Gold.